Sulfur hexafluoride (SF6) is a particularly potent greenhouse gas. It is used in large electrical equipment, and leaks into the atmosphere during maintenance. Once it is in the atmosphere, it is only destroyed if it reaches very high altitudes, making it last for hundreds to thousands of years. It is also a very strong absorber of infra-red radiation. These factors result in it being one of the most potent greenhouses yet discovered. One tonne of emissions is thought to be equivalent to releasing over 22,000 tonnes of CO2. Global SF6 emission rate from 1970 to 2008. The solid line shows the estimate using AGAGE measurements. In collaboration with many of my AGAGE and NOAA colleagues, we examined how concentrations of this gas have increased in the atmosphere since the 1970s, and determined global and regional emissions (see Atmospheric Chemistry and Physics paper). We find that concentrations of SF6 have increased by more than a factor of 10 since our first measurement in 1973. We also find that global emissions are now higher than ever, and have increased by almost 50% in the last 5-10 years. We wanted to find out where this increase in emissions was originating from. To do this, we used measurements made by the AGAGE and NOAA monitoring networks and a three-dimensional chemical transport model. 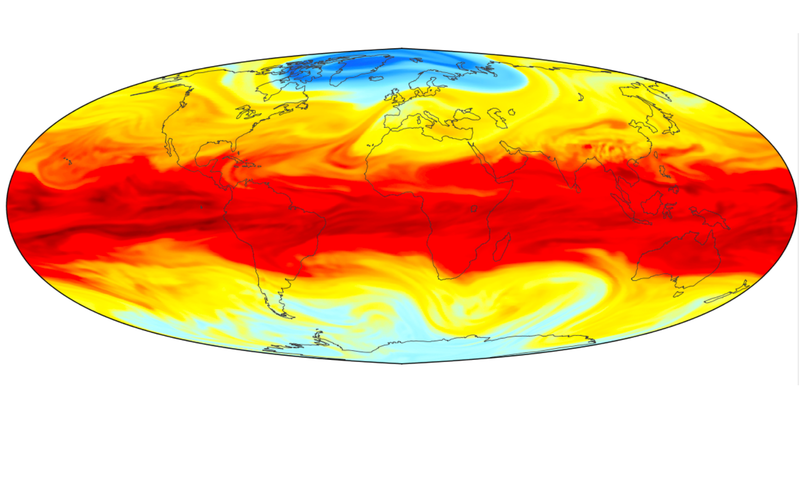 The model (called MOZART, developed by the National Center for Atmospheric Research), uses wind speeds and other meteorological information that have been calculated using weather forecasting models, to simulate how pollutants are transported around the world. By testing how this model responds to changes in emissions from different regions, we can use the measurements to find out where SF6 originated from. There were two major findings from our work. 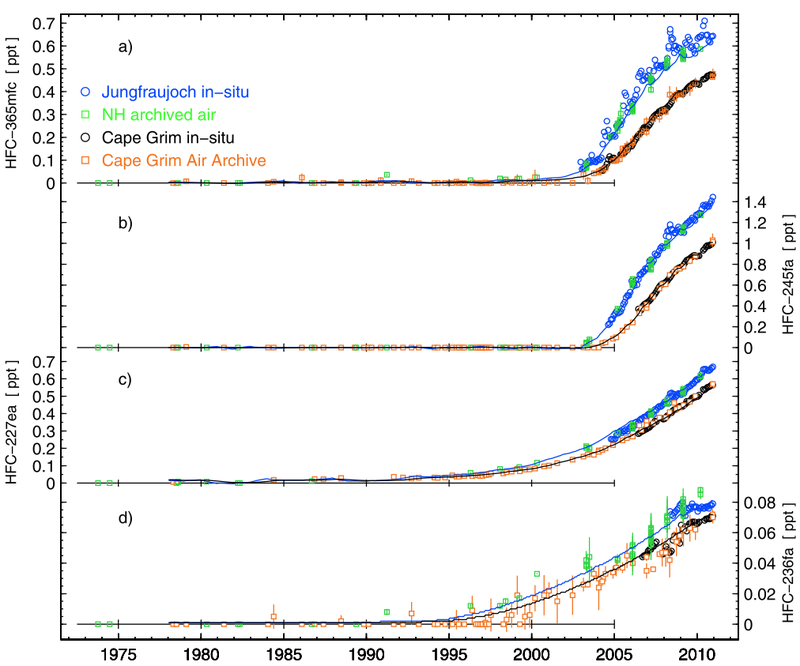 Firstly, we find that it is very likely that all of the recent emissions increase is being driven by an increase in emissions from Asian countries that do not report detailed emissions to the United Nations Framework Convention on Climate Change (UNFCCC), such as China, India and South Korea. Secondly, we find that developed countries that do report emissions to the UNFCCC (e.g. USA, UK, Germany), are likely to be underestimating their emissions. 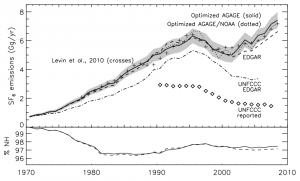 EDGAR emissions interpolated to 5×5 degrees and scaled in each hemisphere using AGAGE measurements between 1970 – 2008 can be found here in NetCDF format. Regionally optimized EDGAR emissions at 1.8×1.8 degrees for 2004-2005 and 2006-2008 can be found here in NetCDF format. Optimized 3D mole fraction fields at 5×5 degrees, and 28 vertical (sigma) levels are here in NetCDF format (10MB). Methane is a strong greenhouse gas, and plays an important role in the chemistry of the atmosphere. Global concentrations are currently more than double their pre-industrial values (as shown by ice core data). However, in recent years this dramatic growth has slowed, and was close to zero between 1999 and 2006 (see graph below). 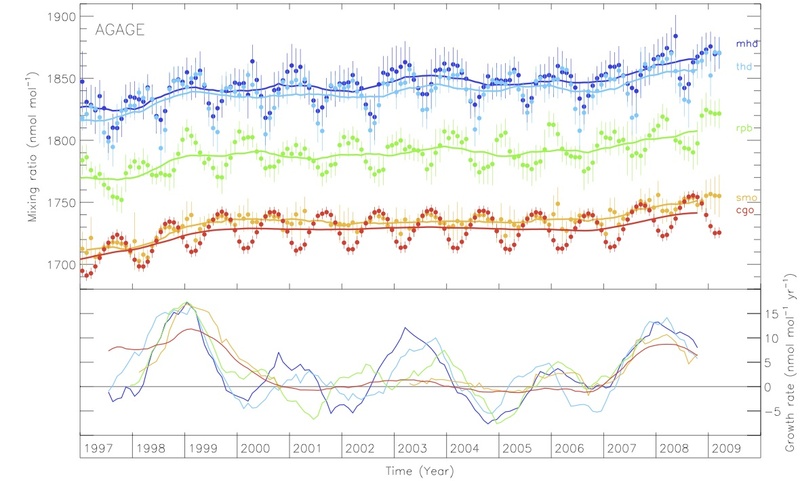 In this paper, published in Geophysical Research Letters, we presented AGAGE and CSIRO data showing renewed global growth of methane concentrations starting in 2007. We speculated that some natural process was most likely responsible for such a rapid change in concentration, since anthropogenic emissions tend to change more slowly (a few percent per year). For example, wetlands, the single largest source of methane, could have increased their emission rates in response to changes in temperature and precipitation (2007 was an extremely warm year over Siberian wetlands). Alternatively, we note that a modest decrease in the concentration of the chemical that destroys methane, the hydroxyl radical (OH), could produce a sudden growth. Methane mixing ratios at five AGAGE sites from 1997 to 2009. Annual mean growth rates are shown in the lower panel. Modified from Rigby et al., 2008. There was an additional puzzle to this methane increase, which was that growth occurred across the globe at almost the same rate. Most of the methane sources are in the Northern hemisphere, so we would usually expect to see growth beginning in the North, and then propagating to the South later on. This near-simultaneous rise in concentration in both hemispheres suggested that tropical emissions could have played an important role. In the two years since the publication of this paper, lots of groups have examined these strange fluctuations in methane levels. In particular, Ed Dlugokencky at NOAA and Philippe Bousquet at LSCE in France have written some very nice papers on the subject (Dlugokencky et al, 2009 in Geophysical Research letters and Bousquet et al, 2010 in Atmospheric Chemistry and Physics Discussions). They find that the most likely explanation for the rise since 2007 has been an increase in emissions from northern wetlands in 2007 and then an increase in tropical wetland emissions in 2007-2008. They find little evidence for a large change in OH concentration or large increases in biomass burning. Our paper received some press attention in 2008 (e.g. 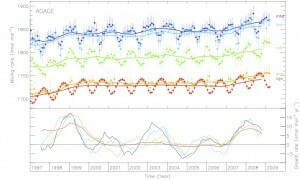 MIT press release, “Climate Warming methane levels rose fast in 2007”, Reuters). 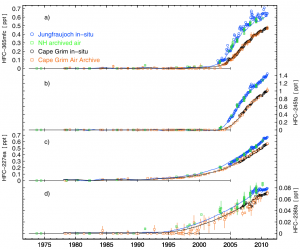 It was also quoted in several articles suggesting that melting arctic permafrost could be driving the increase (e.g. “A sleeping giant?”, Nature Reports Climate Change). How much the arctic permafrost melt is contributing to changing methane concentrations is still the subject of much research. However, as mentioned above, it seems most likely that the recent increases can be explained by changes in output from existing wetlands. In addition to these articles, the paper also caught the attention of some people who drew slightly unusual conclusions from the work. Some thought we had “inadvertently disproved global warming” (“MIT Scientists Baffled by Global Warming Theory, Contradicts Scientific Data”, TG Daily). The article also triggered an interesting discussion on the popular “climate sceptic” website Watts Up With That?. I hope it goes without saying to most readers that the rise in methane concentrations since 2007 does not “disprove global warming”. Whilst the recent fluctuations do seem to be driven by changes in natural emissions, it is worth bearing in mind that man-made emissions account for around 60% of the total emission rate (and hence the more than doubling of concentration since pre-industrial times). The continuing rise in concentration of all greenhouse gases is of a great deal of concern (see the latest Intergovernmental Panel on Climate Change report for a comprehensive review of the latest climate science).